Corrie Baldauf found reading this book a bit tough, so she kept track of colors using these Post-its. Whatever it takes I guess. It has its own kind of fascination, though I’m not altogether sure why keeping track of the allusions to color would help the reader stay focussed and get through the book. Book Patrol shows us her copy of Infinite Jest. 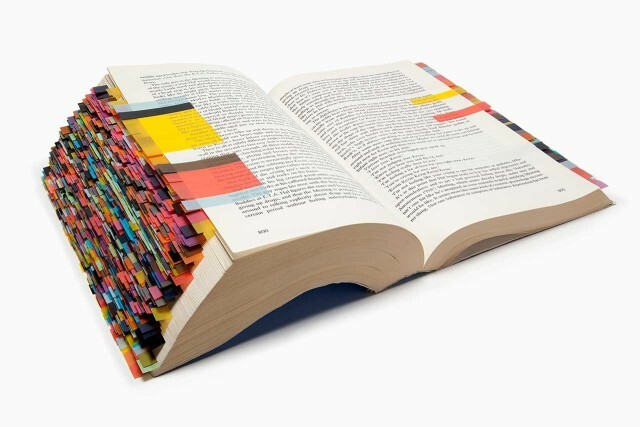 A few years ago there was an extravagant edition of the Bible which color coded words and sentences. My recollection is that it was more detailed than the one in this picture, where the color is simply a tint box behind a paragraph. I think the one I remember was printed with the actual words in different colors, which must have been a nightmare on press. Keeping register even if you only used spot colors would be tough: achieving it with process builds would surely be verging on the impossible. Apparently color coding your Bible by hand is something serious people do — there’s even a book about it.